Mankind still strives to solve many of the world’s natural mysterious phenomena, even after roughly 6,000 years of civilization. They come in all forms, each has its own appeal, they all captivate our imaginations and some could be outright terrifying. Many of these mysteries have fascinated mankind for thousands of years but some of them have started appearing only recently. A few phenomena present themselves amid displays of great power and force, though infrequently. Some of them appear more commonly and seem harmless, just mysterious. Still, others remain passive, yet permanent, simply waiting to be found and observed. These phenomena are as varied in the nature of their character as in their occurrences. As rare as these phenomena are, good photos of them remain rarer still. We present our list of six Mysterious Natural Phenomena for you to enjoy because everyone enjoys a good mystery. Volcanic Lightning starts off our list of Mysterious Natural Phenomena and has awed those who witness it throughout the ages. When you consider the total area of the earth’s surface, volcanic eruptions themselves remain rare occurrences. In recent times science has finally advanced enough to provide us sufficient warning. Furthermore, incidents of volcanic lightning appear only in a tiny percentage of eruptions which makes solving the mystery of their origin quite difficult. Many people, scientists, and amateurs alike, continue to try, however. Let us first point out the sheer power of volcanic lightning. It creates one of the greatest concentrations of energy in Nature. The amount of raw energy released in the form of volcanic lightning during an eruption rivals an entire supercell thunderstorm. That’s incredible. This type of lightning forms much closer to the ground. It also doesn’t always move downward like regular lightning. 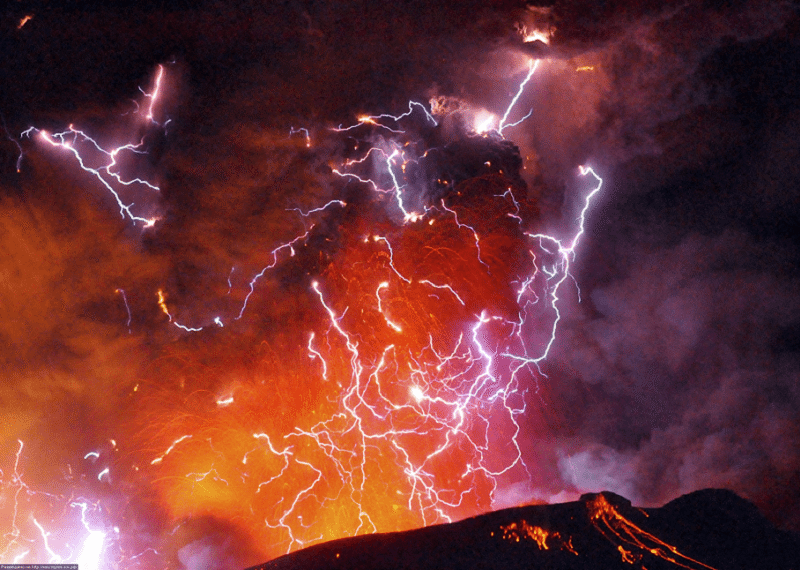 Yet, the incredibly powerful bolts of electricity stay almost entirely contained within the plume of volcanic ash. Those rare times it occurs also only involve Plinian eruptions which are the most powerful type. Volcanologists have proposed numerous theories to explain the phenomenon but none have been conclusively proven, so the mystery continues. Few photos of any quality exist of our second natural phenomenon, the fascinating and elusive Naga Fireballs. We regret the poor photo quality. Witnesses of these mysterious lights often compare them to fireballs, thus the common name. They remain a highly localized phenomenon with people spotting them only along the Mekong River. Also, they have only been reported along a specific 155 mi (250 km) section of the river. While they appear throughout the year, more occur during the full moon in late autumn, than any other night. This fact merely makes for yet another mystery. These so-called fireballs actually appear to rise from the water. The reason remains unknown (hence the mystery). Though they rise to heights of as much as 985 ft (300 m), they disappear rapidly and typically glow with a primarily reddish or orange color. They also vary in apparent size from a mere speck to the approximate size of a basketball. Furthermore, sometimes only a handful appear, while on other occasions thousands may be seen in a single night. Some propose that flammable phosphine gas from the swamps may explain these fireballs. Yet such would neither ignite spontaneously nor remain burning long enough to rise high above the river. The mystery therefore continues! The little known geological phenomenon of the Ringing Rocks sits next on our list of Mysterious Natural Phenomena. They are located in Bucks County, Pennsylvania, in the United States. Striking the rocks with a hammer (or even another rock) causes the stones to make a ringing sound as if they were hollow…but they’re not. Despite numerous scientific studies of the stones, the reason of the sound remains unknown. As a result of slides, boulder fields on a hillside always form at the bottom of the hill, This one, however, sits near the top of the hill. Its formation there constitutes yet another mystery. The Earthquake Lights have been around for centuries, yet sightings remained virtually unpublicized until the advent of photography. They appear either before, during, or immediately after the occurrence of an earthquake. In general appearance, they look very similar to an aurora, yet their typical colors include white and blue. Unlike auroras, they rarely appear at altitudes of more than 2 mi (3.2 km). The lights rarely last more than a few seconds, but on rare occasions, they last as long as 10 minutes. This unpredictability makes studying them quite difficult. The lights seem to appear at different distances from the epicenter of the earthquake they accompany. Sometimes they are almost directly over the epicenter, while at other times as far away as 250 mi (400 km). They could occur even over the ocean. The only thing scientists know for sure about them has to do with the strength of earthquake as they have only been reported during earthquakes with a Richter scale rating of 5.0 or above. The leading theory of their origin and formation involves the release of ionized oxygen by the breaking of certain stone types. Unfortunately, like most of the items on this list, their very rarity means that quality photos remain virtually non-existent. Our next item on the list of Mysterious Natural Phenomena often attracts the most interest of all. Ball Lightning has been sighted by (sometimes terrified) witnesses since the ancient Greeks. Young Czar Nicholas reportedly encountered an occurrence of ball lightning during a church service in the 19th century. Prior to 1963, scientists dismissed reports of it as nothing more than an urban myth. A group of scientists, however, witnessed both the occurrence and the disappearance of a glowing orb float down their aisle on an airplane. Since then, scientific research has expanded. While theories abound, none are confirmed. The phenomenon appears in association with thunderstorms, but the orbs last far longer than usual lightning – up to several minutes. They also range in size from a mere speck to nearly 10 ft (3 m). Colors vary and include white, yellow, and orange. Also, many reports claim that the orb eventually explodes violently. One researcher in the 18th century died in front of witnesses when he came into contact with an orb of ball lightning. In 2014, an observer finally captured the optical spectrum of ball lightning. The origin and nature of the phenomenon remain mysterious. The Hessdalen Lights are the final entry on our list of Mysterious Natural Phenomena. This phenomenon remains confined to a limited geographical region: it appears within the confines of a narrow 7.5 mi (12 km) valley in rural Norway, and nowhere else! The first reported sighting of these mysterious lights occurred in the 1930’s. They sometimes hover, and at other times move at great speed, just like ball lightning. Unlike ball lightning, they do not appear in association with storms of any kind. Instead, these lights typically appear on nights that stay clear and calm. The Hessdalen lights appear in yellow, white, and red and normally last mere seconds. They also occur less frequently than other natural phenomena. On average, people spot them between 10 and 20 times per year. A research team has been studying the area and the lights since 1983. They and others have proposed numerous theories to explain the mystery. One of these theories suggests a rare form of combustion involving the rare element scandium found in the valley. Another theory involves what some call dusty plasma. So far none have been confirmed, however, so the mystery continues. Mysterious Natural Phenomena – What Next? The human race has come far in its understanding of science. At least of some sciences. Nature continues to remind us that we still have much to learn. It proceeds at its own pace and does not come with a manual. We must be patient if we wish to truly learn about our world. We must remember that Nature has had billions of years to create surprises. She would not divulge all her secrets quickly or easily. Human civilization has existed for the blink of an eye in the life of the earth. It is madness to think that we could have solved or even seen all of its mysteries in our short tenure here. Truly understanding our world requires more than just intelligence, it requires wisdom as well. We have to show we can develop wisdom. Part of that wisdom is taking care of this world while we learn about it. Only then might Nature reveal more of its mysterious natural phenomena. If we are lucky, that is.